If you have onced visited Bali island & been in a Balinese restaurant, perhaps you're already familiar to this blanched vegetables salad. 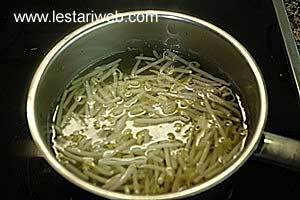 It is commonly served as a a companion for the famous balinese fried duck/bebek bengil or balinese grilled fish. In an original recipe, especially for the native, this salad is usually made with a lot of chilies since the Balinese like spicy foods. But of course for western tourist, they prepare it differently. You will never get it spicy ;-) !! 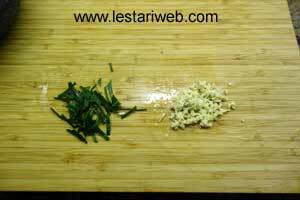 The important seasoning spice for Jukut Urab are Kencur (Lesser Galangale) and kaffir lime leaves. So try your best to get them both, even if they are in dried or grounded package. 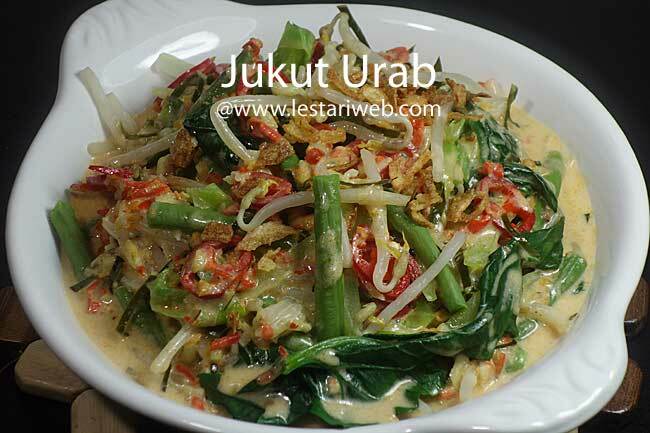 Because without those two mentioned items, Jukut Urab will never taste the same & authentic. So if you are a chili fans & wanna try an authentic taste of this balinese vegetable salad, then try to cook it yourself at home as spicy as you can stand ha ha..
For blanced vegetables : discard the rib of the cabbage, thinly sliced. Put aside. 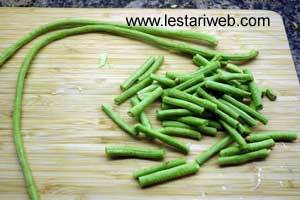 Discard the both ends of long bean and cut about 5 cm/2 inches long. Put aside. 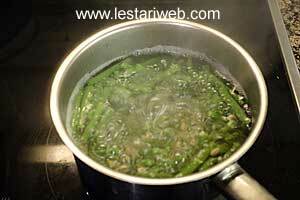 Pour in enough water in a medium-size of saucepan with a pinch of salt. Bring to boil. Blanch the long bean for about 4 minutes until cooked. Set to drain in a colander. 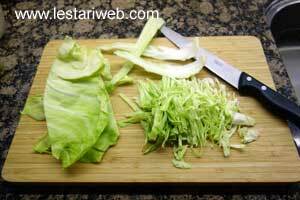 Blanch the cabbage for about 2 minutes until just wilted. Set aside to drain. 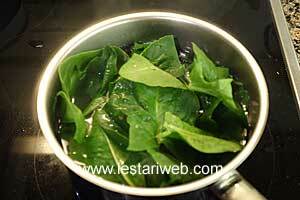 Blanch the spincah just 1 minute, make sure the spinach is not overcooked. Set aside to drain. 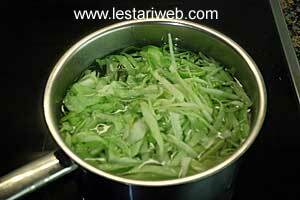 Last but not least soak the beansprouts in the boiled water for 1 minute only. Set aside to drain. 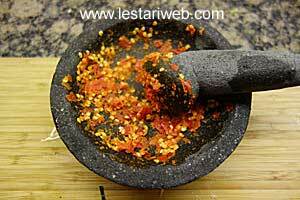 For coconut milk dressing: Put the chillies and shrimp paste in a mortar / grinding stone and grind until smooth. Peel-off kencur/lesser galangale, crush it gently and finely chopped. Slice the kaffir-line leaves finely. 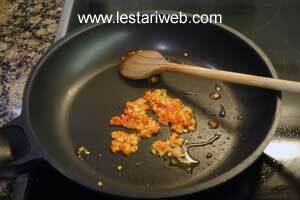 Heat 1 tbsp oil in a wok or a small saucepan. Stirr-fry the paste until fragrant. 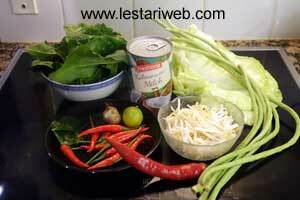 Add the chopped kencur & sliced kaffir-lime leave. Stir just shortly until the leaves just wilted. Add the coconut milk, salt & sugar. 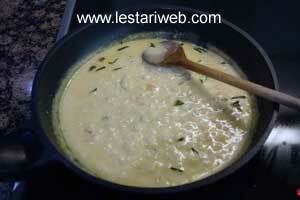 Cook over medium heat until the coconut milk get boiled. Stirr occationally. 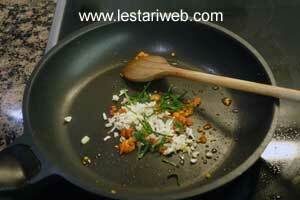 Adjust the taste, add salt or sugar if necessary. Remove from heat. 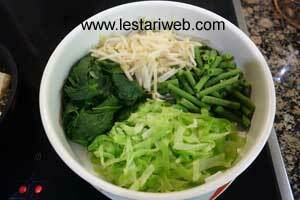 Serving Method: Arrange the blanched vegetables in a large serving plate. 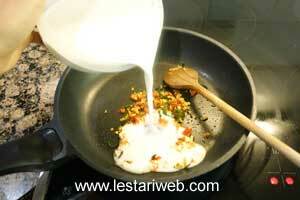 Add the coconut milk dressing & mix them throughly. Garnish with sliced chili & fried shallot. Serve immediately or in room temperature.